By no means traditional (I have a belly-button pierce and toe rings! ), I’d still be hard-pressed to ask someone out on a date. I’m shy that way. But in this case I could not let the opportunity pass me by. I guess when you really want something you make the effort…right? I wanted a date with this author. Forget Hollywood celebs, forget professional sports figures…the real heroes of this world are authors. Authors spread knowledge. And after reading Happily Ever After Divorce by Jessica Bram, I knew I simply had to meet her…so I did not hesitate to ask her out. Some people balk at e-mail when you want to get to know someone, but if you know anything about me, you know I loathe phone calls. (Really, it’s just hard to hear on my tiny cell phone.) So I wrote Jessica an e-mail and she answered! The first sign of a promising date is they communicate, and make time for you. We agreed to meet at a bookstore café (perfect!) for coffee. She was as upbeat and as interesting as her book and blog. As memoirs often do, Happily Ever After Divorce filled all kinds of gaps in my own story. After all, what’s life without the human experience and someone to relate to? 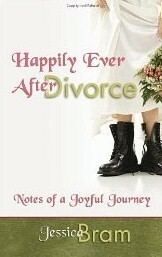 Happily Ever After Divorce is matter-of-fact and not fru-fru, with just the right dose of reality, humor and bravery. Yes, bravery. It takes insurmountable courage and strength to raise 3 kids on your own, while fending off legal bullets. We had common ground (also known as chemistry in the dating world). Jessica has some inspiring stories, ranging from dating disasters to home fix-it fiascos to travel tales. All told in a way that helped me realize that although divorce – or “re-singled” as she would rather call it - is a harrowing experience, the world keeps right on spinning, and at some point, you need to jump back on. And you’d be amazed at how high you can jump. Writing is a GIFT to the world. By sharing her story with candor, Jessica risked letting others into her reality. Now she has a successful business conducting creative writing workshops and helping others pen their amazing stories. Asking her out on a date was…worth every word.